Drawing on its vast experience and carefully nurtured skill sets, IndianOil has made successful forays in diverse areas such as Natural Gas, Petrochemicals, Exploration & Production, Renewable Energy, etc. Over the years, Natural Gas has emerged as the 'fuel of choice' across the world. It is steadily replacing traditional fossil fuels due to its environment friendly characteristics which help in meeting the stipulated automobile emission norms. Natural Gas has significant cost advantages over fuels such as Naphtha and commercial LPG. IndianOil took up natural gas marketing in 2004. Since then, it has been investing across the Natural Gas value chain and envisages greater presence in this segment in the future. Its innovative 'LNG at the doorstep' initiative has benefited bulk users located away from gas pipelines. The "LNG at Doorstep" initiative involves making LNG available to the customers not connected by gas pipeline. Gas is transported through a cryogenic system, stored in a cryogenic holding tank at the target location and re-gassified on-site through vaporizers for use as fuel. The entire operation, being concealed, eliminates the possibility of adulteration and pilferage. Introduced in 2007, this initiative has been well received and is attracting more customers located away from the pipelines. As co-promoter of PLL (Petronet LNG Ltd.), which has set up LNG (Liquefied Natural Gas) import terminals at Dahej and Kochi, IndianOil has marketing rights for 30% of the LNG procured by PLL. It is setting up a 5-MMTPA terminal at Ennore near Chennai for LNG imports and also sourcing more LNG directly to meet the increasing domestic requirements. IndianOil currently operates city gas distribution (CGD) networks in Agra and Lucknow through Green Gas Ltd., its joint venture with GAIL (India) Ltd. It is also implementing CGD projects in Chandigarh, Allahabad, Panipat, Ernakulam, Daman, Udhamsingh Nagar and Dharwad through a joint venture with M/s. Adani Gas Ltd. (M/s. 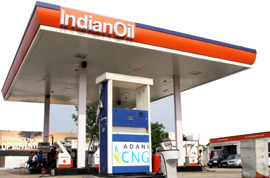 IndianOil-Adani Gas Private Limited (IOAGL) . IOAGL's CGD networks in Chandigarh, Allahabad have already been commissioned. The Corporation is implementing a 5-MMTPA LNG import, storage and regassification terminal at Kamarajar Port (Ennore) near through a joint venture company (JVC) - IndianOil LNG Pvt. Ltd. The terminal is targeted for completion in 2018-19. The coming on-stream of this first LNG regasification terminal on the east coast would mark a major milestone in IndianOil's efforts to scale up natural gas infrastructure in the country. IndianOil holds equity LNG of 1.3 MMTPA on FOB basis for a minimum of 20 years in the Pacific NorthWest (PNW) LNG Project in British Columbia, Canada.